Camberwell isn't notorious for being the culinary capital of London, let alone South London, and probably not even Southwark! However, I have lived in the area for a while and it astounds me as to the variety of food you can get here. We have Italian, Greek, African, Caribbean, Indian and Chinese restaurants as well as having numerous pubs serving pretty good grub and before I forget, need to mention the chippies and kebab shops! The latest addition to the neighbourhood is FM Mangal, which as it's name suggests is a Turkish ocakbasi (an open charcoal grill). Located on the site of an old African members club, it's conveniently located in the middle of Camberwell Church street, and the smell of the grilling meat can be smelt all the way down the road. Quite some sphere of influence. I'm a huge fan of their takeaways. Every time I pop in, they welcome you like an old friend and try to ply you with tea and Turkish delight. After multiple visits, I thought I better do a quick write up of it. Turning down the Turkish delight (not my thing at all) I accepted the offer of some apple tea and sat opposite the coals to wait for my food. The takeaway box deal is amazing value. 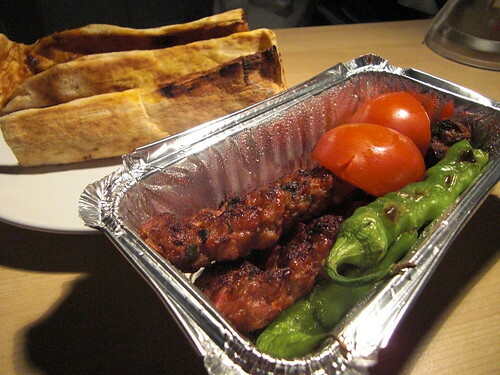 For £5.50, you get two Adana kebab with grilled chillies and tomatoes, a side salad and a heap of Turkish flat bread. The Adana kebab are long strips of lamb flecked with herbs and chilli peppers wrapped around skewers and grilled over those coals. What we get is a taste sensation, the char on the outside containing succulent, smoky lamb. The bread is cooked on top of the meat so that it retains some of the juices whilst cooking and is sprinkled with a dash of paprika. The salad on the side is quite substantial and is stuffed with cabbage, lettuce, tomatoes, herbs and all sorts of other veggie goodness, all doused in a vinaigrette. And I can't forget the chilli sauce, containing just the right amount of heat, infinitely superior in comparison to the tomatoey mess you usually find in your high street kebab shop. I love FM Mangal, it takes a large amount of willpower for me not to pop in every night. I haven't actually been in to eat yet, but no doubt this will happen soon enough. Here's to Camberwell getting one step closer to becoming that culinary capital. I keep meaning to go here! Bit of a crime I haven't got round to it since I live just down the road. Must.try.harder. Its fab - go there soon! And as the original article said Camberwell is very well provided for with restaurants all of which offer very high standard food at reasonable prices. Looks very tasty! So many places to try, viva local restaurants!! I went in tonight for a takeaway kebab, LOVED IT. I played it safe and had a chicken wrap - best I have ever tatsed and am gonna go back and try other stuff on offer. My friends had the lamb with peppers and Falafel both enjoyed immensley..... And the experience while waiting was nothing like waiting in the usual kebab houses of the area. We were greeted as we walked in and given a menu. 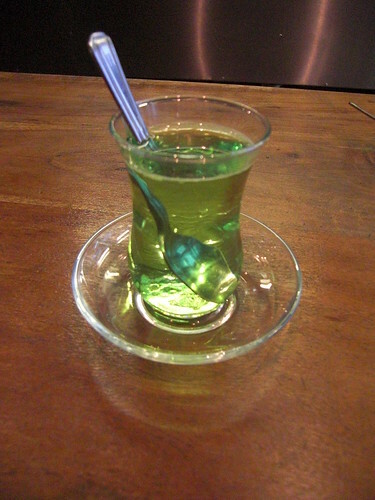 Then offered some apple tea and turkish delight. Waited maybe 10 minutes watching our food and a strange looking flatbread for someone else being cooked - must go back and try some of that. 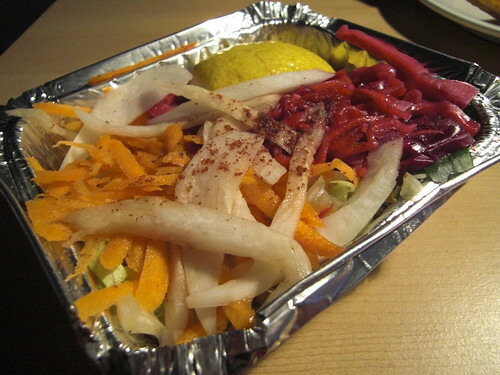 If you're in Camberwell and in need of a kebab go straight to FM Mangal do not pass go!!! This place is fantastic: the food is excellent, the service faultless and the price more than reasonable. I go here a lot! Ok this is on my list.